All of his obituaries note that the play that propelled the 24 year old director into the public eye was his production of the English language premiere of Samuel Beckett’s Waiting for Godot in August 1955 at the Arts Theatre London. While some critics thought that Waiting for Godot was ‘an odd mass of nonsense’ (Ronald Barker in Plays and Players), the influential Harold Hobson and Kenneth Tynan recognised that Godot was taking theatre in a new direction – Tynan noted that the play forced him ‘to re-examine the rules which have hitherto governed the drama; and, having done so, to pronounce them not elastic enough’. That Hall was strongly drawn to Beckett’s theatre anticipated his championing of Pinter when he staged The Homecoming in 1965 at the Aldwych amid considerable opposition. Hall returned to Waiting for Godot several times during his career, from his 1997 production at the Old Vic with Alan Howard and Ben Kingsley to the 2005 production at the Theatre Royal, Bath, which then transferred to London. He also directed Felicity Kendall in Happy Days in 2003. Hall’s 2005 Godot used the revised text of Godot as edited by Professor James Knowlson in the Theatrical Notebooks of Samuel Beckett series (Faber & Faber), based on the Godot notebooks held in the Beckett Collection at Reading. Hall’s productions of Godot brought out the rhythm and musicality of the text and the nuanced interactions between the two tramps and Pozzo and Lucky. Critics and indeed Beckett himself thought that the original production was not spare enough, and Hall’s designs for Godot evolved in his later productions. These tend to establish a tension between the open space of the stage on which Didi and Gogo wait for Godot and a sense of interior entrapment, evoked in the later productions through floorboards rather than rough outside terrain. The floorboards also suggest the stage itself, evoked in Waiting for Godot as the place known as ‘The Board’. Hall’s Arts Theatre production featured a rather bog like set with reeds and thick undergrowth. 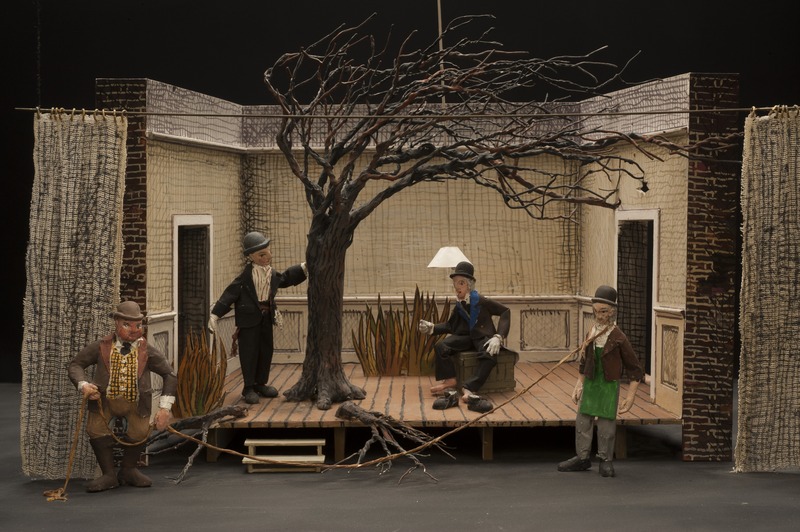 However, the Beckett Collection at the University of Reading holds a model box by Peter Snow, the designer of Hall’s 1955 Waiting for Godot, prepared for the production’s transfer to the West End Criterion Theatre which was considerably larger than the tiny Arts Theatre. This maquette is extremely detailed and modelled on the actors for the 1955 production including Peter Bull as Pozzo. It is set in a room, with a light fitting hanging from the ceiling and, yes, the floorboards that would re-emerge several decades later. At the same time, there is a tree in the middle of the room, and some reeds from the original Arts Theatre design. In the end, the interior setting was discarded for the Criterion transfer, but it evidently continued to haunt Sir Peter and to influence the design of his later productions. The maquette is part of the Katharine Worth archive in the Beckett Collection. Such archival remains of productions of Beckett’s plays such as those of Sir Peter Hall, give us a unique glimpse of how Beckett’s work has been interpreted in the past, and how it is part not only of the history of twentieth century playwriting, but of the creative processes and legacies of major theatre practitioners such as Sir Peter Hall and the actors and designers they worked with. Visit the Beckett Collection at Reading for more information. More information on UK and Irish productions of Beckett’s plays can be found on the Arts and Humanities Research Council funded Staging Beckett project website.